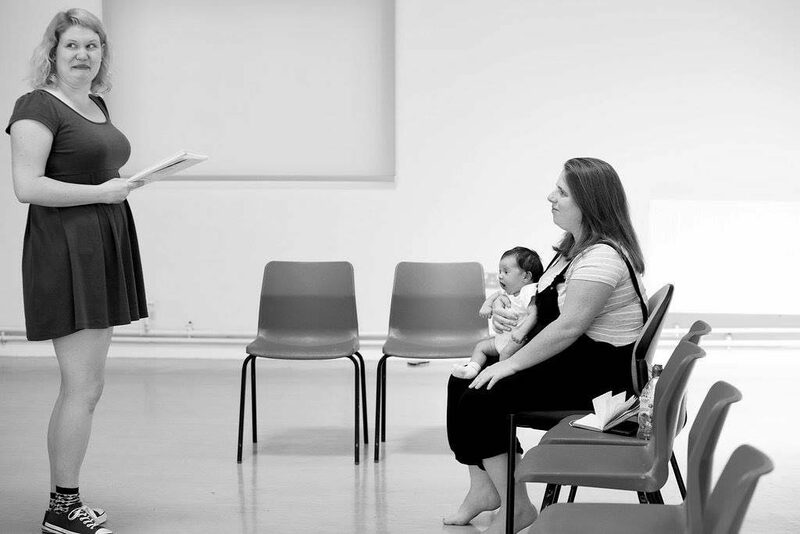 Mothers Who Make: Director, Nicky Diss and her daughter in rehearsal. Photo credit: lhphotoshots. What if the enemy is not the mothering, or the implicit baby, or the pram but the fact that it is all in the hall – that the woman is stuck indoors. What about if she got out? Remembered the world out there, felt able to enter it. What about those walks in the park, when the ideas come fast, whilst the child is charging ahead to go down the slide or jump in the sand? Really I think this is the truth of it. That the enemy of good art is neither the child, nor the pram but the way that both of these things, and how they are seen, can end up making a woman feel unable to get through the hall and out the front door. I have never owned a pram, or a pushchair. I used slings all the way for precisely this reason – I didn’t want a pram blocking up the hall. I wanted to be able to get out the house as swiftly as possible when needed. The more I live it, and listen to others living it, the more I believe the sombre enemy isn’t the obvious things that go along with having a child – the lack of time, space, sleep, money, childcare – none of these help but none of them, at the end of the day are ‘enemies,’ out to get the artist and stop her at her work. It is something deeper than these ‘lacks’ which is the real enemy we are dealing with here – a lack of confidence. Think about it. Suppose the woman who has a pram in her hallway were to feel the same sense of entitlement that I am sure Cyril Connelly felt in relation to his art-making and critiquing. Suppose she felt it was her unquestionable birthright to be an artist. What if she trusted that the world needed her art, in the same way that her child needed her, that her hours spent on it were worthy and worthwhile. What would she do? I believe she would find a way to make good art – she would not let the baby or the pram stop her. She would push down that hallway and walk her baby round the park however many times it took, scribble down the ideas on the back of the scrap of a colouring page she found stuffed in the bottom of the pram. 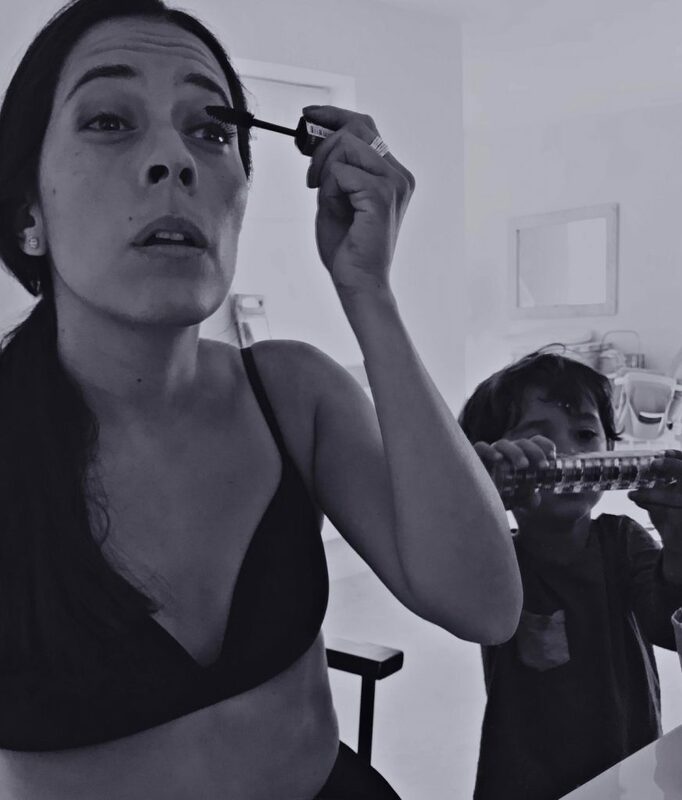 Mothers Who Make: A self-portrait of actor, Jimena-Larraguivel and her child Luken. Getting ready for an audition. It always amazes me the long list of things which women manage to achieve on a daily basis whilst also looking after their children, everything from cooking meals, to making phone calls, to running marathons, literally. I do acknowledge that the act of making supper is different to that of, say, making a show, but I nonetheless refuse to put ‘producing good art’ in its own entirely elite category separate from a host of other challenging tasks requiring great sensitivity, patience and stamina which mothers manage to carry out. So how come mothers can do so many amazing feats but not pull off the making of good art? Well, firstly they do pull it off. All the time, all over the place. But if ever they don’t, I believe it comes down to this sombre question of confidence. The difference lies not so much in the fact that making art requires a set of conditions that no other kind of task requires but that mothers doubt their right to make art whereas they do not doubt their right to make supper. I can feel it now, in myself. I am low on sleep. I have tiny amounts of time but I could be writing my novel and in these last few months I have done precious little writing. I have helped sell my mother’s house. I have set up a new home. I have not been writing. And the real reason is not the pram in the hall. It is that I have fallen off the tightwire of my faith in myself and it is hard to get back on. It has nothing to do with the children. Everything to do with them because of the attitude that Connolly named so famously, which is still pervasive. Because of the ‘just’ that still precedes the phrase ‘being a mum’; because in many places, prams and their small inhabitants are still unwelcome; because money is our main measure of value and so any activity that does not immediately generate it is hard to deem as worthwhile. And given all of this, when a woman is tired, and vulnerable, which comes with the territory of bearing and caring for children, then it is extraordinarily difficult to hold onto the conviction that her efforts at art-making, of whatever kind, might be valid, worthy, even important. Which is why, amongst everything else, one of the feats I am performing alongside being a mother is running a national initiative called Mothers Who Make, for any kind of mother and any kind of maker, professional and/or passionate, with prams, slings, buggies, babies and big children too. They are all welcome and not just in the hall. They are welcome all the way into the main room, where the great art happens. We have made our way into 20 arts related venues across the UK in monthly peer support meetings. We live online too, on a website, on Facebook, on Twitter, so that you can connect with us from wherever you find yourself. We are there to validate your mothering and your making and to say, yes, emphatically yes, it is worthwhile. It is vital even, because there is no more sombre enemy of a good world than the pram, the children, the mothers and their great art, being trapped in the hall and never making it out the front door. Find your nearest hub here. Alternatively, you can start a hub. Mothers Who Make is run by founder, Matilda Leyser, and producer, Lizzy Humber, supported by Improbable.